This doesn’t happen very often, but this scribe had to hit “pause” on the Lying Figures track “Monologue of a Sick Brain.” Reason being, pre-recorded, laughing voices placed so promptly in the mix made it feel like there was an intruder mucking about the premises. It proves the point that there is no such thing as background music. Of course, that really wasn’t the case (the intruder, that is), but such trickery will forever be associated with The Abstract Escape, an album that falls firmly into the melodic death doom box. All the prominent bands of this ilk get the nod on the influence scale for Lying Figures: classic Katatonia, My Dying Bride and Saturnus, meaning, there’s going to be a heavy reliance on gnarled death metal vocals. Indeed the vocals of Thibault Robardey are a bit too harsh sometimes. He’s upfront and domineering, sure, but he’s got a little too much heat on his growls on “Hospital of 1,000 Deaths” and “The Mirror,” a song that invites some partially discernible spoken-word moans from the man. But point being, a little more delicacy and thought around the vocals would help Lying Figures, as their musical foundation is hoisted by solemn guitar lines and sobbing melodies, many of which hit the mark. The running concept of traversing into the mind of a “devastated and broken human being” certainly is fitting for the death/doom on display. 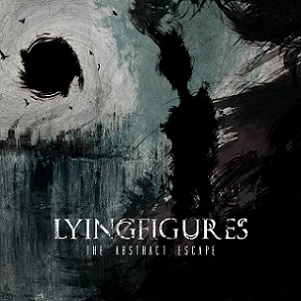 Lying Figures captures that mindset and more on The Abstract Escape, an album that bears all of the tortured, dreary hallmarks we’ve come to expect from the style’s leaders.